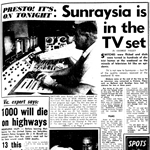 Saturday, 23 December, 1961 – fifty years ago today – brought an early Christmas present to residents in the Goulburn Valley and central Victorian regions with the respective areas receiving their first TV stations. Just two weeks after the debut of GLV10 in Gippsland, BCV8 was opened in Bendigo and serving central and north west Victoria, and on the same night GMV6 was opened in Shepparton and the Goulburn Valley. BCV8’s local programming in the very early days included a 15-minute news summary at 6.45pm each weeknight read by Ron Alderton (who would later appear on ATV0 and GMV6), with an expanded 30-minute bulletin from 6.30pm on Thursdays to include a weekly segment presented by the Department of Agriculture. Alderton also presented Be My Guest, a brief interview segment screened in the mid-evening three times a week. The channel’s afternoon children’s session was Cobber’s Teleclub, hosted by John Crook, who later went on to Hobart channel TVT6 and then had a long stint as a morning show host at Brisbane’s TVQ0. On Saturday afternoons BCV presented a weekly Sports Roundup and on Saturday evenings during the winter there was Football Forum, presenting a post mortem of the day’s games of the Bendigo league. On Monday and Tuesday evenings there was the latest on the local cattle sales in the Stock Report. 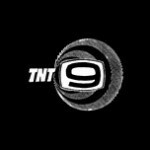 Local variety acts appeared in A Date With 8, a brief segment that appeared at various times during the week where there was an odd five or ten-minute gap to fill in the schedule. 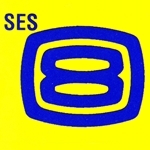 Like many commercial channels in that era, BCV presented a line-up heavy in imported – particularly American – material but the channel in its first year did pick up a number of popular Australian programs from the capital cities, including Bandstand, The Mobil-Limb Show, The Channel Nine Show, Pick-A-Box and Sunnyside Up. By the late 1960s regional stations were beginning to open translator stations to expand their signal to audiences in fringe areas where reception would normally be patchy. BCV8 launched its Swan Hill translator BCV11 (later BCV10) in May 1967 with a variety program, Variety Eleven, hosted by national TV personality Tommy Hanlon Jnr and featuring performances by local artists from the Swan Hill area. With the two channels in operation, the station then became known as BCV-TV. Bendigo was the site of ABC’s first regional television station, ABEV1, launching in 1963 – and ABC stations were soon to spring up around Victoria in Shepparton (ABGV3), Ballarat (ABRV3), Albury (ABAV1), Gippsland (ABLV4), Mildura (ABMV4) and Swan Hill (ABSV2) with their own network of translator stations in smaller towns. 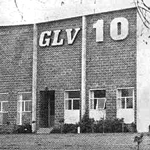 By 1973, BCV8 had partnered with GLV10 (later GLV8) to form a network presenting a common program schedule and offering national advertisers the advantage of offering a larger regional audience with a single buy of airtime. They were later joined by Mildura channel STV8. Like many regional channels, BCV presented opportunities for talent that would later become known on a wider scale. Glenn Ridge was a presenter of a music program, Breezin’, in the early 1980s before becoming host of Sale Of The Century, and Sandy Roberts had a stint at BCV8 before joining the Seven Network. In 1986, BCV8 won a TV Week Logie for most outstanding contribution by regional television for its local newscast, Newshour. BCV continued to produce local news from Bendigo until the change in branding to Ten Victoria in 1994. BCV and GLV are now part of the Southern Cross Ten network which through a series of acquisitions has now expanded through regional New South Wales, Queensland and parts of South Australia. With three regional television stations opening within two weeks of each other in 1961, Victoria was leading the way in the roll-out of regional television – but there was to be an raft of new stations open during 1962 in parts of New South Wales, Queensland and Tasmania and in Canberra. Hi Robyn, please note that any footage of such programs are unlikely to still be in the archive. This page has more information or you could try to contact Southern Cross Ten (ex-BCV8) in Bendigo but I doubt they will have the resources to assist. Hi Barbara. Unfortunately your chances of finding this footage is remote. You can try and contact the station that you saw the ad on but I doubt they’d have any archive of it now. I need to contact someone re the transmission from Goshen to Swan Hill. All channel 9 sites are plagued with pixilating. Why? Do you have archives going back to 1979?? I don’t have any video archive back that far. You could try the National Film and Sound Archive or the Australian Television Archive. The Cohn’s Cobbers tv club was actually sponsored by the Bendigo soft drink company, ” Cohn’s Soft drinks”. The Cohn family were well known and respected in the Bendigo community. I was one of their members as well as the Ansett ANA Flying Club, which also had a spot on the local Bendigo tv station. I had my club badges for years and surprisingly, as a member, actually got an Ansett vinyl carry on bag with soaps and face washer etc as everyone who flew got in the early days. Thanks Eva, I always wondered where the Cohn’s name came from. Now I know! Could you please advise me if there is any archive available to access of early BCV-8 equipment or personell. I was involved with the Station installation and transmission from Mt Alexandria until Feb.1963. I would dearly like to access this material to add to the personal history I am writing. Hi Stanley. Thank you for your message. I am not aware of any BCV8 collection as such or whereabouts any former personnel. However the Australian Television Archive http://www.austvarchive.com and Regional TV Australia http://regionaltv.org/wp/ might be of some interest to you.